We are sold out of advance tickets for this show. There may be some limited standing room only tickets available once the show starts at 8:00 pm for $33.50. Hot Rize has been astounding the bluegrass world with their fresh, contemporary approach to traditional music ever since their formation in 1978. 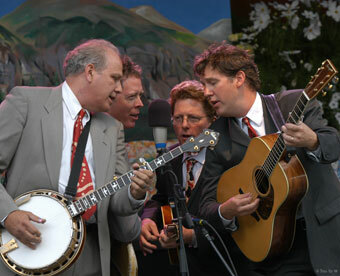 Named after the secret ingredient in Martha White flour (a longterm sponsor of bluegrass music), the band's unique and progressive style of bluegrass, powerful original songs, tight-as-a-drum ensemble playing, and dynamic stage show quickly made them stars on the major festival circuit and far beyond. In 1990 Hot Rize was named Entertainer of the Year by the International Bluegrass Music Association, the first such award ever given out by the organization. While they've pared back their performance schedule to just a few memorable shows each year, the band continues to blaze trails and knock socks off to this day, with original members Tim O'Brien (vocals, mandolin, fiddle), Pete Wernick (banjo, vocals), and Nick Forster (guitar, bass guitar, vocals) joined by guitarist Bryan Sutton, who took the place of the fourth founding member, Charles Sawtelle, who passed away in 1999. Their 2002 live album, So Long of a Journey, continues to be a classic in music collections around the world: as Billboard magazine put it, "Tighter than bark on a tree, Hot Rize tears it up and pleases the crowd. Totally impressive." Tonight's audience is in for a double treat tonight, thanks to special guests Red Knuckles and the Trailblazers. Frequent touring partners with Hot Rize, this Western swing outfit features Red Knuckles (guitar), Waldo Otto (lap steel and pedal steel), Wendell Mercantile (archtop lead guitar), and Slade (bass). This is absolutely a show not to be missed!